Soft but durable. Warm but breathable. Wherever your next adventure takes you, this water and wind-resistant all-season jacket has you covered. Polyester/spandex woven shell bonded to 100% polyester microfleece with laminated film insert. 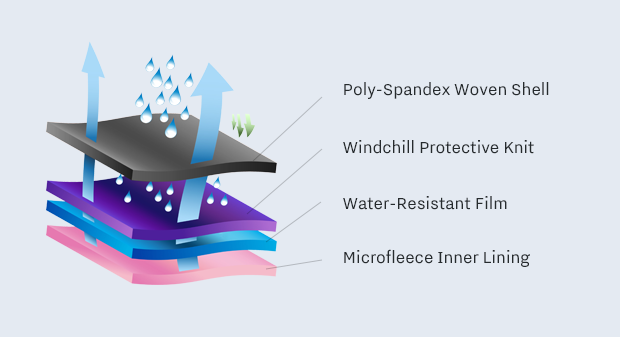 A water-resistant outer shell ensures that you stay dry whether you’re exploring the darkest rainforest or scaling the highest peak, while superior insulation technology keeps your core protected from heat loss in temperate and sub-arctic environments. Every jacket sold helps promote education about the Holocaust - the worst genocide in history. Over ten million people, including six million Jews, were massacred by the Nazi regime in Germany. Holocaust education is essential to prevent this catastrophic episode of history from repeating itself.